Homeless Senior Veteran Finds Empowerment Through Purpose at Veterans Empowerment Organization. 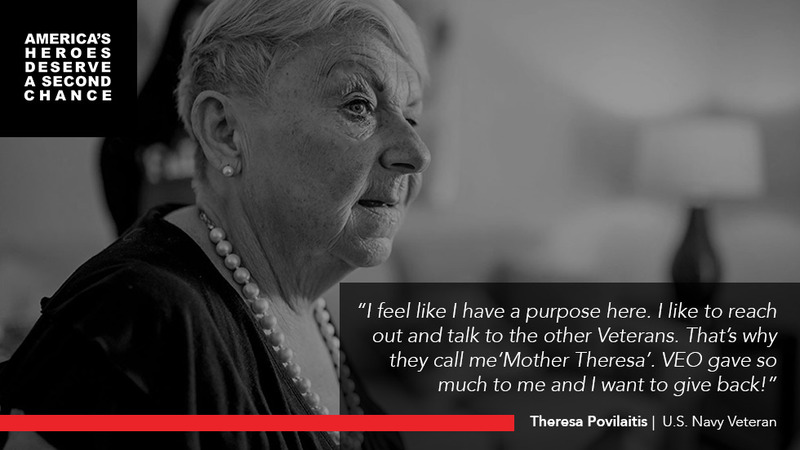 Theresa Povilaitis, VEO Hero and Navy Veteran found new purpose on campus in her role as a Resident Assistant in Women’s Housing. The brick townhomes serve a number a growing number of female veterans with a Permanent Supportive Housing Model. Everyone calls her “Mother Theresa” for good reason. She takes the time to listen and encourage everyone she meets. We caught up with the 70-year old to hear about her journey from homeless to safe housing and what she most looks forward to. Q. What was your journey from homeless to VEO housing? My husband died after decades together in New York. As you can tell from my accent, I am from Long Island. Several years ago, I moved to Georgia and tried to live with my children. It did not go well, and I had nowhere else to turn. Q. Tell us about your service in the military? I enlisted in 1971. My three-year stay was at NATO headquarters in Norfolk, Virginia. We were JAG CORP — Judge Advocate General’s Corp. As a paralegal, or what they called yeoman. I worked hand-in-hand with NATO attorneys. We had access to maps of Vietnam, pegboards and pins showing the troop movement. We printed out form letters which were sent to to families of deceased soldiers. No computers. I don’t like to talk about it. My brother was killed while in college. He intended to become a doctor. So, I got out of the military early to be with my mother. Q. How did you find Veteran’s Empowerment Organization (VEO)? A bus driver connected me to the Cherokee County Homeless Veterans Program. A West Point graduate named Jim Lindenmayer directed me to VEO. I arrived on March 24, 2017. Q. What do you most look forward to? I look forward to the next time that Falcons and cheerleaders come to campus! We have had so many fun events with the team — Falcon’s games, campus events, the VEO 10th Anniversary, and of course the Rooms to Go make-over. I got to be on television during a Falcons Game. The make-over showed on the stadium Halo and reached about 70,000 people. When we were making our way back to our seats, all of these people came up to me a thanked me for my service. I am so grateful to everyone who helped make that happen! Q. How would you describe VEO to those who have never heard of the organization? VEO provides a very supportive environment that allows veterans — from any age group — to rebuild our lives. Mr. Fortune gives us dignity which we lost over the years. Everyone on the staff cares about the clients.